Have you ever accessed our services before? Or know somebody who has? To enter the draw please ensure you provide a method of contact at the end of the survey. Welcome our new Chair of Trustees! A message from our new Chair of trustees - introducing Pamela! We have been granted £4078.87 by the Co-op community fund! Co-operative members shopping in Penwortham, Lostock Hall and Bamber Bridge food stores and funeralcare have raised £10,000 for three local causes. During 2017/2018 the causes were Galloways, Rene Sladen Guide Hut and ICANN! This donation is going towards running a twelve month pilot advocacy project to support carers of those with dementia, and the people with dementia that they care for at two dementia day centres in Preston and South Ribble. Our new project is due to launch in the new year - watch this space! Tea for more than two. ICANN says thank you. IT’S VOLUNTEER’S WEEK ONCE AGAIN and to celebrate ICANN is treating its loyal team of volunteers to Afternoon Tea at Samlesbury Hall near Preston. 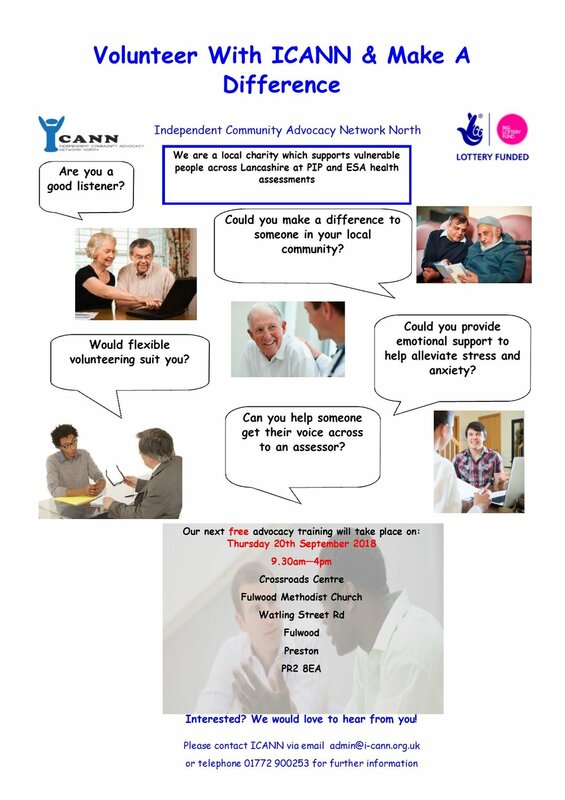 ICANN supports vulnerable people across Lancashire at PIP and ESA/UC Health Assessments. This would not be possible without the dedicated volunteers who give up some of their time to help and support people. To say thank you, ICANN have invited them to an afternoon tea, to celebrate their hard work, for them on Wednesday 6th June 2018. Volunteer Co-ordinator Julie Hutton explained “Being a volunteer is a fun way to gain confidence and develop new skills. It is about making a positive difference to someone’s life. A volunteer will possibly face new challenges as well as making new friends. All this whilst giving back to the community”. The health benefits of being a volunteer are improved health and well-being, such as, reducing blood pressure, increased satisfaction and improved mental health. It can be a stepping stone to secure future employment. Our next volunteer training is scheduled to take place on Thursday 17th May 2018 from 9.30am – 4pm at the Crossroads Centre, Fulwood Methodist Church, Watling St Rd, Fulwood, Preston PR2 8EA. Please contact us, if you would like to attend. After 6 and a half years administrating for ICANN, Pat Tootle has left us this week. Pat and the staff enjoyed a lovely send off, with lunch earlier in the week. Pat's role will be taken on by our new staff member Shirley Blackburn. Thanks for everything Pat, and enjoy your retirement! We support people across the whole of Lancashire and are always on the look out for people with any skills they can bring. Or, email us at: admin@i-cann.org.uk.